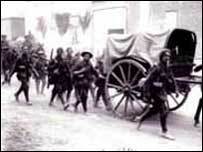 Sunday sees the 84th anniversary of one of the bloodiest battles in Ireland's War of Independence. But it will be taking place amid intense debate among historians over recent research by a former Queen's University, Belfast, academic alleging that an IRA leader had surrendered soldiers shot in cold blood. Now, another expert says he has found new evidence of a British propaganda "spin" operation which discredits all official British accounts of the time. For nationalists, the ambush at Kilmichael in County Cork, was seen as a turning point in their fight against British rule, which was to lead eventually to the foundation of the Irish State in 1921. 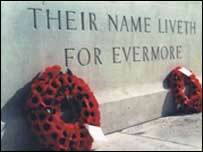 Seventeen auxiliary officers and First World War veterans died in the ambush by an IRA flying column led by Tom Barry. Three IRA men also died - two of them shot, according to Barry, after they stood up to take the surrender of a group of auxiliaries. Speaking on film before his death in 1980, Barry said: "The Auxies opened fire immediately (on the IRA men) and they killed them with revolver fire after surrendering. "I shouted at the same time to the Section 'Keep firing and don't stop until I tell ye'. They tried to surrender again and I said 'Don't take any surrender'. "We wouldn't take prisoners after their false surrender and after killing two of our men." But Barry's account has been challenged by Canadian historian, Dr Peter Hart, in his book The IRA and its Enemies. He says the notion of a "false surrender" was made up to excuse the execution of defeated auxiliaries in cold blood. As well as presenting a report allegedly made by Barry to his IRA commanders - which some historians dispute as a British forgery - he cites seven unpublished accounts, including two from anonymous witnesses he interviewed. "Seven accounts by eye witnesses, two of whom were interviewed by me, say there was no false surrender. Either they explicitly deny it or they make no mention of it at all in their accounts. "So I think there is an enormous preponderance of evidence giving accounts of the ambush radically different from Tom Barry's," says the former Queen's University academic and now associate professor of history at the Memorial University of Newfoundland. British fury over the ambush was reflected in newspaper articles which wrote false reports of the mutilation of the bodies with axes of those killed at Kilmichael. 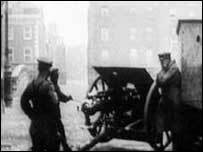 The ambush intensified the war in Cork: Martial Law was declared on 11 December 1920 citing the mutilations, and on the same night the centre of Cork was sacked by British forces. But new research by another historian, Dr Brian Murphy, reveals that fictitious "official" accounts were run from a British propaganda office. It was established in August 1920, just three months before Kilmichael, headed by British army Major CJC Street in London, and former journalist Basil Clarke in Dublin, to counter propaganda from the underground Irish parliament Dail Eireann publication Irish Bulletin. "Basil Clarke said we must engage in propaganda by news rather than propaganda by views and he said we must do this in accordance with truth and verisimilitude, that is the air of being true but not strictly true," says Dr Murphy. "Major Street said that for propaganda to work it must be dissolved in some fluid which the patient will readily assimilate and official news is the best way of doing that." In his book published before Dr Murphy's research, Dr Hart says that the British information on the ambush "seems to have been remarkably accurate" while Tom Barry's account was "riddled with lies and evasions". He also cites a report captured by the British from Barry to his IRA commanders to back his analysis - a document which others say is a forgery. Dr Murphy says that because reports were labelled "Official", newspapers carried accounts, often false, which represented British "spin". Any analysis of the time which relies on official British papers must take this into account, he says. "To dismiss - as Dr Hart does - Barry's account as 'lies and evasions' I don't think is tenable. "It must be now very close as to whether Peter Hart has to qualify his statement in the light of the fact that the hand of Basil Clarke was at work in defining what happened at Kilmichael," says Dr Murphy. But Dr Hart disagrees: "My account is based on IRA witnesses, not on the British report. One of the points of my looking into Kilmichael was to examine the kind of stories and labels which came out of the event - both sides calling each other terrorists for example and to try and get to the truth behind it. "The truth is, as I think the whole book shows, that really in many ways the two sides acted in much the same way whether in terms of propaganda or thinking or violence." But Barry's biographer Meda Ryan - who recently published a book on the IRA leader - maintains that her interviews with the IRA leader and Kilmichael survivors, including her uncle who was beside one of the IRA men when he was shot, do not corroborate Dr Hart's analysis. "Admittedly it was years later but it was so vivid in their minds," she says. "This was a major event and if a major event occurs in somebody's life then they will remember it with stark reality. In fact they were really adamant about the 'false surrender'." Dr Hart - who's also finalising a new biography of Michael Collins - says he does not mind criticism, but feels that some of his critics are not open to debate. "The typical reaction of critics is not that I have some things wrong, but that I have everything wrong and that everything Tom Barry says has to be right. "It's almost a kind of faith-based history, a pseudo-history rather than a real debate where people concede some things and put forward others or are sceptical about weak points and accept the strong points."